I love political season. (Granted, not this extended season we have now.) But the flag stickers, the crisp fall air, the spirited debate of big ideas. Ahh, the debates. In honor of this, one of my favorite times of year (every four years), I present an election night party. A comfy flag sweatshirt is festive without being too cheesy. Add burgundy chords and sea foam flats to round out an on trend outfit. Set the mood with dozens (and dozens and dozens, if you're feeling ambitious) red and white balloons. 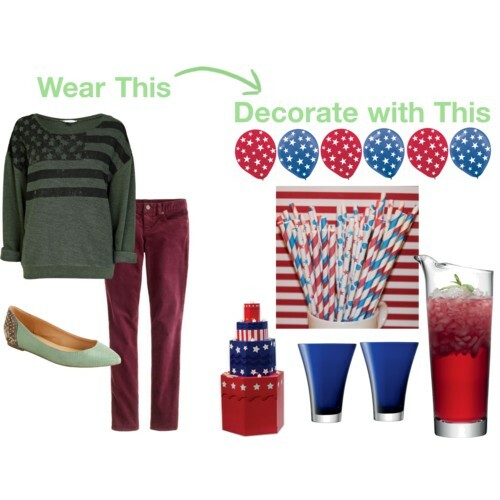 Add a fun table topper, and serve a pitcher full of a red-toned adult beverage in cobalt glasses (stars and stripes straws are optional, but oh so fun). Now, pay attention to those debates!